One evening, a friend gave me a call and told me she knew of a case which is interesting to know but she has yet to be able to explain the predicament. It’s a shop located inside a very big and famous mall in Klang Valley. This mall has some interesting history. The main mall was constructed during Period 7 and they started business then. As they grow they extended the new wing some years later during Period 8. This shop is located in the new wing. Both the old and new wing is sitting Wu facing Zi. Why this business after operations for just few years has decided to end it due to poor business.? In this case, the difficulty is to determine the period of the shop. Should the owner use period 7 or period 8 chart? Is this a disadvantage of Flying Star System or it’s due to inadequate knowledge? If you know the Advance Flying Star system, this is a very easy answer. All shops have a center door. As you scope into the shop, it’s a very simple setup. only a few product display shelf and a cashier. 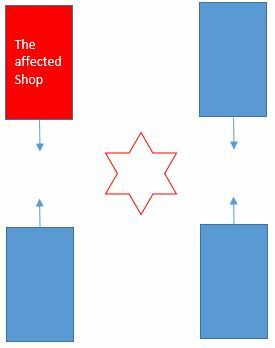 If you visit the shop it has a star shape feature outside on the left corner as shown in the floor plan. Thus many would jump the gun and blame in on the Sha Qi caused by this star shape feature. However, don’t forget the other 3 adjacent shops is also “exposed” to this Star shape feature. How does one explain why they survived and still has sufficient business traffic? The answer lies in the layout of the shop and in particular the cashier. How do we place the cashier? Big and Small Taiji method? Good Luck to you. Acquire authentic Feng Shui skills or engage a lineage master for consultation to avoid the frustrations and losses.